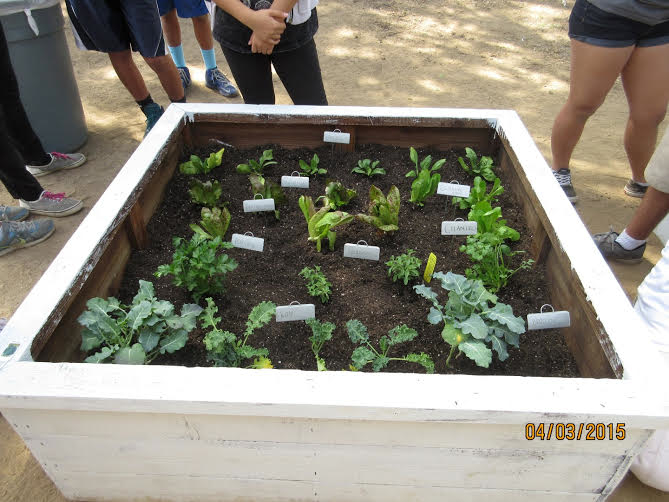 What can make gardening with 8th graders a cool experience? The Center for Urban Resilience’s (CURes) Urban EcoLab curriculum, a group of enthusiastic junior high school students who don’t mind getting dirty and an indoor/outdoor science classroom. 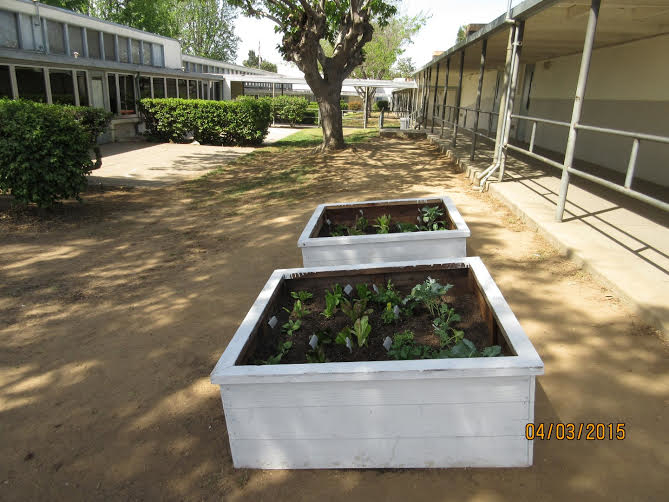 Yes, it’s still hard for me to believe that I was able to start an edible garden at Martha Baldwin School in Alhambra. Believe me, I’m not a garden expert at all, but being able to have a set of lessons with classroom activities was surely a great teaching tool! Being a member of the CURes Teacher Academy Program has been a wonderful and enriching experience. There were about fifteen teachers in the academy this year, all from various grade levels. We would meet one Saturday a month at Playa Vista Elementary School, which is a great location for field activities that help demonstrate some of the science concepts. Being able to partake in a class once a month helped me strengthen my science skills. The array of modules teachers can select from is outstanding. What I found is that students really need the hands-on and real world experiences. The CURes program does just that. One of the strength’s of the CURes program is the relationship and collaboration especially with your grade level teachers. This was one of the most beneficial aspects that helped me strategize my lesson plans. When I chose “Climate Change” as my main module, I pondered the endless activities I could do in the classroom. Being able to talk, listen, and share ideas with my fellow Academy teachers helped steer and ease the pressure of lesson planning. The teachers in the academy are very friendly and cooperative, and most of all, we all understood and shared the challenges each of us face in the classroom. When I implemented the first lesson of the Climate Change module the class was so engaged I was thrilled! The Urban Ecolab lesson plans provided a framework aligned to the Common Core State Standards and allowed students to use higher thinking skills and analyze data. There were a total of five lessons that culminated with creating a green space at the school – an edible garden. Being a two-year member of the Urban Ecology Teacher Academy has been a great experience. 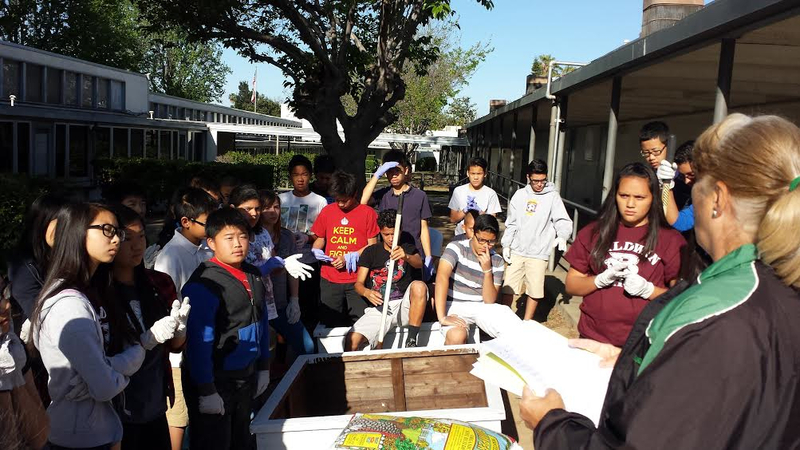 There are an abundant number of interactive project-based urban ecology lessons that have fostered my growth especially in the field of science as well as math, language arts, and history. I’ll never forget what one of the eighth graders told me as we completed the garden beds, “Mrs. A, this was a very fun project to do, I am going to start a garden at home!” The school garden became a hands-on science lab, a refuge during recess, a focus for sketching and a showcase for all students to come and explore. Teaching and learning are sophisticated endeavors. I thank the CURes Staff for the time and efforts in putting together such a wonderful program. I look forward to continuing my Urban Ecology STEM education training, and most of all being able to integrate the lessons into my classroom once again. Our two edible garden beds. Martha Baldwin School 8th grade students with Executive Director of Friends of Ballona Wetlands, Lisa Fimiani. The edible garden with labeled plants. About the Author: Patricia Allaf is an 8th grade teacher at Martha Baldwin School in Alhambra, California.